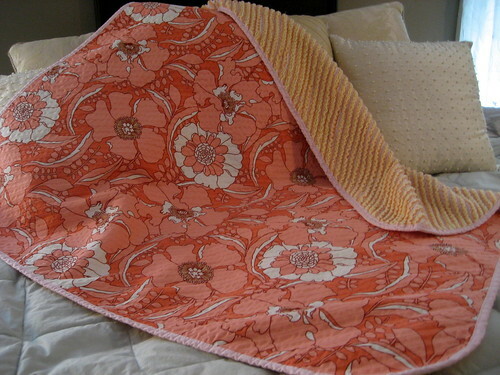 Heirloom cut chenille baby blanket, originally uploaded by SewLaTea. The only thing I did differently was that I made my own binding. I used a pale pink solid, which almost takes on a peachy feel next to the tangerine. I love pink and tangerine together so it was a good match. The chenille was surprisingly easy to make! I used Olfa’s Chenille Cutter which made the process quick and easy. My friend started hers using scissors and it didn’t take her long to go to the store and buy the chenille cutter which she said was MUCH easier. I only made one big goof while making the chenille which was cutting through ALL the fabric (eeek!) I only got about 1 1/2 inches in before realizing so I just took off that much on each side while squaring up. I love the rounded corners (something I’ve been wanting to do for a long time!). Gives the blanket such a warm, cozy and professional look. 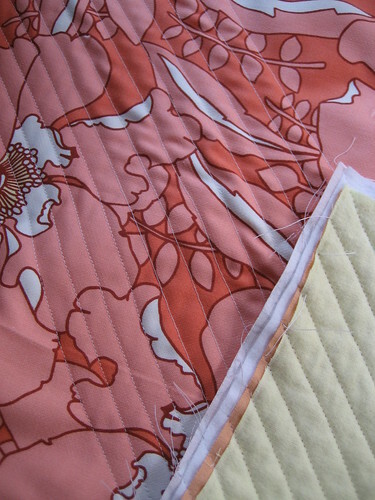 I had wanted to hand bind the binding on as I do with quilts, but once I got the front sewed down, I realized hand binding onto that chenille might not be the best idea. I then just pinned the binding all around and top stitched the entire thing. A little less “neat” than I was going for, but I think will last longer and made more sense. 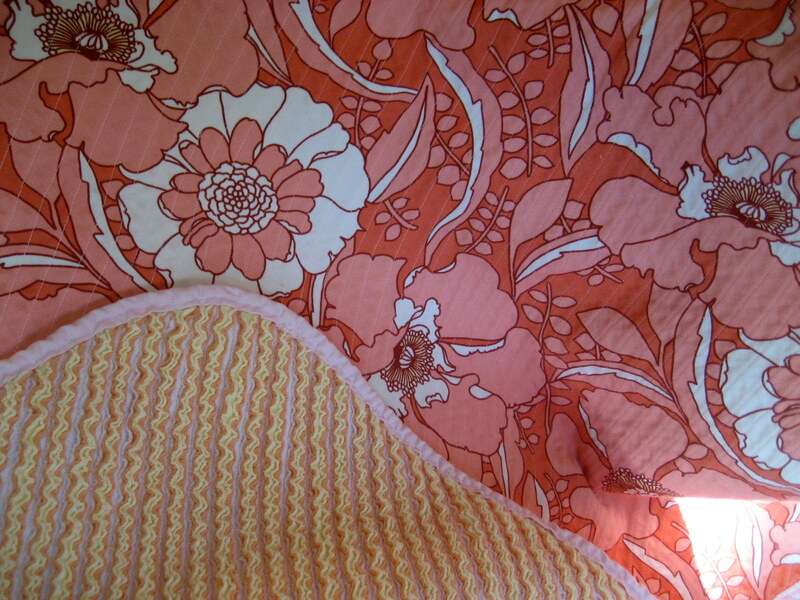 *WIP* Heirloom Cut Chenille Blanket, originally uploaded by SewLaTea. Just a peek at what I’ve been working on the past few days. I used Aesthetic Nest’s AWESOME tutorial. Now had a been a good student, I would have remembered that she said to sew only ONE line flannel side up…and then to flip over and stitch with the fabric side up…I learned 8 lines later….and a bobbin tension issue clear as day 😦 I decided to keep sewing. and sewing. and sewing. I considered taking out those stitches that looked goofy, but after seeing it all sewn, I barely noticed those lines…oh…or the wonky lines 😉 Good thing this yummy blanket is for myself and not being gifted! I love this tutorial. I love the way it came out. (Blanket is getting all snuggly now in the wash). More pics to come. BTW–YES I did copy Anneliese’s fabric too (I hope she won’t mind!). I fell in LOVE with the entire package, and couldn’t see past this yummy Amy Butler print (August Fields, Dream Poppies in Tangerine)…I just had to use it too. (Copying is a form of flattery, right!? ).